Learn about the Moy Yat Ving Tsun (Wing Chun) lineage - From the creator of Ving Tsun to our school's chief instructors. The following text is a translation of three seals from the Kuen Kuit which detail the origins and lineage of the Ving Tsun family. The Ving Tsun system started during the Qing Dynasty under the rule of the Emperor Yung Jing. The Shaolin Temple was burned down. Five of the senior monks hid themselves in different mountains. The nun, Ng Mui, lived in White Crane temple in Wan Nam. She saw a snake and a crane fighting. This gave her an idea to modify the kung fu she knew. She met a girl named Ving Tsun and taught her the new kung fu so she could defend herself against a bully who wanted to force her to marry him. Ving Tsun later divided her new system into Siu Nim Tau, Chum Kiu, Biu Jee, Moy Fah Jong, Luk Dim Boon Kwan, and Bot Jom Doa. Her followers named the style after her. She passed the art on to her husband Leung Pok Toa, who passed it on to Wong Wah Po. Wong Wah Po passed it on to Leung Lan Kwai, Leung Yee Tai and Leung Jun. Leung Jun passed it on to Fung Wah and Chan Wah Shuen. Grand Master Yip Man learned the complete system from Chan Wah Shuen. Grand Master Yip Man is the leader of the style now. From what I have heard, that is how the family tree has grown. I have set the legend of Ving Tsun in stone carvings for the future generations. Portait of Grandmaster Yip Man (Ip Man). Although the true origin of Ving Tsun is steeped in legend, modern Ving Tsun history has been well documented. The most prominent figure of this martial arts system is none other than the famous Yip Man (Ip Man). Grandmaster Yip Man began his Ving Tsun training at the age of 7 under his Sifu, Chan Wah Shuen in Foshan, China. At the age of 16, Yip Man moved to Hong Kong where he was introduced to Leung Bik, Chan Wah Shuen's senior Kung Fu brother and also the son of Leung Jan.
At the age of 24, Yip Man moved back to Foshan and worked as a police officer. He began to teach Ving Tsun during this time period and had several students who reached a high level of proficiency in the art. In 1949, Yip Man left Foshan for Hong Kong once again as the Communist Party in China came to power. 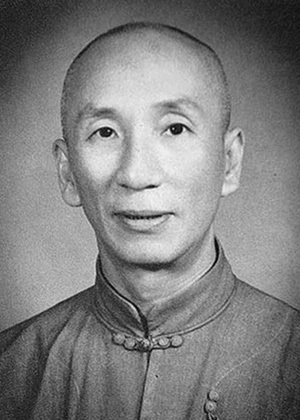 Yip Man continued to teach Ving Tsun in Hong Kong for decades and established the Ving Tsun Athletic Association in 1967. During this period in Hong Kong, Yip Man produced many great fighters and a reputation for Ving Tsun as well as himself. One of the most famous and acclaimed students of Yip Man was also one of his last students, the late Grandmaster Moy Yat. Grandmaster Moy Yat (left) with his Sifu, Grandmaster Yip Man (seated). Grandmaster Moy Yat began his Ving Tsun training in 1957 in Hong Kong under Grandmaster Yip Man. At the age of 24, Moy Yat became the youngest Sifu under the guidance of Yip Man. Moy Yat was a very close student of Yip Man for 15 years and trained with him in Hong Kong until his passing in 1972. After Yip Man's passing, Moy Yat moved to Chinatown in New York City where his reputation preceeded him. He was sought out by many people who had heard of his high level of proficiency and skill in Kung Fu. After some persuasian, Moy Yat began accepting students and his branch of the Ving Tsun lineage now numbers in the thousands around the world. Grandmaster Moy Yat often talked about the Kung Fu Life, an idea that Kung Fu should not only encompass one's physical ability, but the way they strive to live their life. Moy Yat learned the Kung Fu Life by spending countless hours accompanying and caring for his Sifu outside of class. The impromptu life lessons that ensued, as well as the physical Kung Fu training, helped shape Moy Yat into the highly successful, talented and respected person he's remembered for today. In addition to his mastery of Ving Tsun, Moy Yat was also known for his work as an artist, calligrapher, acupuncturist, and reflexologist. Due to his artistic abilities, Moy Yat was commissioned by Yip Man to carve the Ving Tsun history and idioms into stone. This work of art is a treasure for the entire Ving Tsun community and is currently in the posession of Sifu William Moy, Moy Yat's son, who teaches out of his school in Queens, New York. Moy Yat continued to lecture and teach Ving Tsun until his passing in 2001. Grandmaster Moy Tung (left) with his Sifu, Grandmaster Moy Yat (seated). Grandmaster Anthony “Moy Tung” Dandridge began training Ving Tsun under the guidance of Grandmaster Moy Yat in 1980. After a very short time training, he was pleased and amazed to find the incredible power available in even the most basic of the Ving Tsun techniques he had learned. He noticed that sparring partners who had previously been formidable opponents could now be bested easily. Moy Tung realized that such a powerful system deserved and required his complete dedication. Within three years, Moy Tung embraced the training of Ving Tsun Kung Fu as a full-time commitment. Two of Moy Tung’s first six years of training were spent living with his Sifu as a close personal student, a practice carried out only by certain members of Moy Yat’s group of special students, the SSA. During this time he also maintained a residence in Philadelphia so as to be able to give his Sifu space and privacy when necessary. However, he spent the entire time living the Kung Fu life; training constantly and intensely, and being a devoted student and constant companion to his Sifu. This was a period of great personal effort and sacrifice on the part of Moy Tung. He made it a cornerstone of his training to spend as much time with his Sifu as possible while always being able to support himself and to take care of business and personal matters for his Sifu. In 1986, Moy Tung opened the Richmond, Virginia branch of the Moy Yat Ving Tsun Kung Fu Family Association. Today, Grandmaster Moy Tung oversees the training of hundreds of students, grandstudents, and great-grandstudents throughout the country. Sigung Moy Yat Tung (left) with his Sifu, Grandmaster Moy Tung (seated). Dr. Rob "Moy Yat Tung" Squatrito was first introduced to Ving Tsun in the 1980's while attending medical school in Richmond, VA. At that tiime, he had been teaching Karate and one of his students told him about a local martial artist, Grandmaster Moy Tung. Sigung Moy Yat Tung decided to meet with him and after experiencing the effectiveness of Ving Tsun, began training that day and encouraged his Karate students to follow suit. Sigung Moy Yat Tung eventually became a member of Grandmaster Moy Yat's GSS (Grand Special Student) Association. In 1992, Sigung Moy Yat Tung moved to Iowa City to pursue a fellowship in Oncology. During his time there, he began teaching Ving Tsun and opened his first school in 1993, the Moy Yat Ving Tsun Kung Fu Academy. In 1995, Sigung Moy Yat Tung moved to Burlington, VT for his medical residency. He continued his passion of teaching Ving Tsun there and trained a small group of students. He still maintained and managed to oversee training in Iowa City while in Vermont. Sigung Moy Yat Tung eventually moved to Virginia Beach and in 2001, opened a school there where he taught with his wife, Sigungmo Jennifer Squatrito. Today, Sigung Moy Yat Tung continues to teach and guide the training of his inner circle students spread throughout the country, many of whom have been students of his for over 20 years. Sifu Brad Schonhorst (left) with his Sifu, Sigung Moy Yat Tung (seated). Sifu Liz Schonhorst (left) with her Sifu, Sigung Moy Yat Tung (seated). Sifu Brad Schonhorst began training martial arts from a young age. After achieving a high level of proficiency in Tae Kwon Do, he decided to venture out and explore other martial arts. This is in part due to Sifu Brad observing that some of his training partners and classmates struggled in their training, not because of their work ethic, but because of their body type. In 1997, Sifu Brad began training Ving Tsun in Iowa City under Sigung Moy Yat Tung. Within a short period of time, Sifu Brad realized that there was something very special about Ving Tsun. Not only does Ving Tsun not rely on physical strength, height advantage, or other physical attributes, it utilizes principles based on physics, efficiency, and relaxation. After only six months of training, Sifu Brad met up with some of his former training partners and noticed that he was able to easily defeat them while sparring. In 2002, Sifu Brad moved from Iowa City to New York City and began teaching a small group of students in his Brooklyn apartment. In 2004, Sifu Brad opened his first school in Brooklyn and taught there until he moved down to Maryland in 2009. In 2010, Sifu Brad and his wife, Sifu Liz, opened Montgomery County Kung Fu. The school was originally located at a shared fitness space in Germantown, MD. However, Sifu Brad moved the school to the Kentlands community in Gaithersburg, MD in 2011 in order for his students to have their own space to train in and for the school and Kung Fu to truly grow. Sifu Brad continues to teach out of his school in Gaithersburg, MD today and makes frequent trips to visit his students and grandstudents in New York as well as the rest of his Kung Fu family scattered throughout the country. Sifu Liz Schonhorst started training Ving Tsun in 1998 in Iowa City. At the time, Sifu Liz had just started college and was looking for an outlet. Her then boyfriend, Sifu Brad, had been training Ving Tsun for about a year and encouraged her to give it a try. Once Sifu Liz began taking classes, she was intrigued by the precision and structure of Ving Tsun, which reminded her of dancing, a prior interest of hers that also requires precision of movement. A true student of the art, Sifu Liz is still amazed by everything Ving Tsun has to offer after all these years. Through her training and study of Ving Tsun as well as her relationship with her Kung Fu family, Sifu Liz continues to perfect and hone her Kung Fu. She is a firm believer that one can always improve. Sifu Liz is an advocate for spreading the art of Ving Tsun to anyone who is willing to learn. As a woman who has trained and taught Ving Tsun for nearly two decades, she firmly believes anyone can benefit from training Ving Tsun and that it's uniquely suited for women. Unlike most martial arts, Ving Tsun was created by a woman and takes into account a woman's body. Ving Tsun stresses efficiency and even smaller people can be very successful in self defense with Ving Tsun training. Sifu Liz recommends that women train with men as both can learn and mutually benefit from each other. Additionally, this creates a more realistic training experience for women as it's more likely that a woman will need to defend herself against a man rather than another woman. Sifu Liz instructs in the adult classes with her husband, Sifu Brad Schonhorst, and also runs the Youth Training program at Montgomery County Kung Fu.